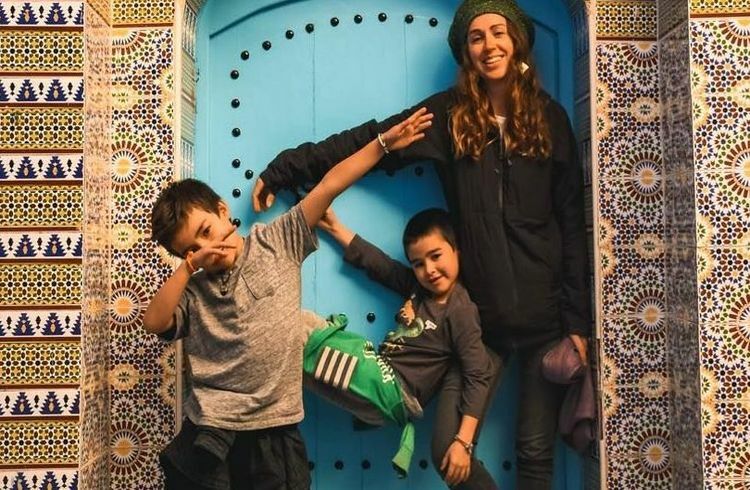 Angie and her young family travel nomadically around the world with barely a possession, while working as a documentary filmmaker capturing stories as a catalyst for change. In this episode we meet Angie Davis, a photographer, filmmaker and journalist who sold everything to travel around the world with her young family and barely a possession. 11:33 The Laps "...Dustin has this idea to do a documentary going around Tasmania with no cash, no car, no phone, and only 10 personal items each." 20:00 "I went in my Oculus VR headset and found a solar system experience, and the kids did a, it's a 15-minute experience, where the kids are in their own little space shuttle..."
Angie Davis is a writer and director. Her work is inspired by global travels, “where untold stories are discovered and shared through storytelling, with a goal of cultivating compassion, the catalyst for change”. Add to that Angie, her two young children and partner Remy travel nomadically across the world with barely a possession. Read their story which started in 2016 when Angie first headed to Columbia, a single mother with boy’s aged three and five. You can follow Angie on Instagram/Twitter: @angiedavisfilms or Facebook. Angie, Remy and her two young boys. “They always want to try and help in whatever way they can”, says Angie. Angie’s first film Double Barrel (Peru) is free on YouTube. The film helped the locals in Lobitos Peru raise funds to conduct marine studies which in 2018 resulted in all seven of their surf breaks in the region begin protected by national law. Angie and Peruvian surf guide Harold are passionate about surfing and the environment, “…these like-minded friends share the story of the oil-dominated town Lobitos with a goal to unite local and international surfing communities to protect the coastline that fringes the region”. Instagram/Twitter @thelapstv , Facebook or the website. Filming The Laps against the elements. Like Angie’s film Double Barrel? Follow the filmmaking journey of World Nomads’ Coleman Lowndes, as he travels to the heart of the Colombian coast to the El Choco surf village. Here, he captures an inspiring story of positive mentorship, where village children are taught to surf by older members of the community. We use the Rodecaster Pro to record our episodes, made possible with the kind support of Rode. Speaker 1: The World Nomads podcast bonus episode. Hear amazing nomads sharing their knowledge, stories, and experience of world travel. Phil: I'm Phil. That the last time I checked. Kim: If this the first time you've tuned in, thank you. We hope you enjoy the episode featuring an amazing nomad. Now that's someone who has demonstrated discovery, connection, transformation, fear, and love through travel. Phil: In this episode we meet Angie Davis. She's a photographer, filmmaker, and journalist, and she sold everything to travel around the world with her young family and barely a possession. Angie Davis: Yes, I did. I left a toxic marriage about four years ago, and I was sort of struggling with trying to be a creative filmmaker journalist, and having two kids, a mountain of debt, and a house to run. So, I decided that seeing as, at the time, I was making films about travel, and also, I was a travel writer, that it would probably be a lot easier if I just took the kids with me on the road, and we would figure things out. Then I would be happier, they would be happier. I would actually get to spend time with them, and I could still do what I do for my work. Angie Davis: I decided to sell everything that I had, and we're not talking selling a house. I didn't have a house. I was renting. I just sold whatever possessions I had. I'm talking pots and pans, and when you go through everything in your house that you've collected over a period of a few years, or longer for other people, you actually have a lot of stuff that you haven't looked at in a long time. I just decided to get rid of it all, break it down into about three suitcases, I think we had at that time, and get one-way tickets to Colombia, and that was sort of the beginning. Phil: How old were your kids at this stage? Angie Davis: We're going back about three years, so they were roughly five and seven, more or less. Phil: How did you feel about taking them into a place like Colombia? Angie Davis: Well, I felt great about it. A lot of other people had their own opinions. I had friends in Colombia, so we weren't flying in blind. We had a place we could go and stay, and that's kind of how I travel. Well, I was doing it back then when it was just me and the kids. We were super excited. It was about five flights to get there. That wasn't the fun part. Angie Davis: For me, it was just liberating. It was being free. It was having all these new experiences. It was meeting new people, and it was just observing how my kids adapted to this new lifestyle I was giving them. But kids are so adaptable, and they make friends all around the world. With kids, whether they speak the same language or not. Kim: You're, basically, hopping from place to place? Angie Davis: Yes. Yes. We did the three months in Colombia, and then we decided ... My sons are half Japanese. My ex-husband is Japanese. We went to Japan to go back to an area where I had spent a lot of time in the Japanese alps in Hakuba for a snow season because I wanted to give the kids the experience of learning all about the mountains. They're something that I just absolutely love, is surfing and snowboarding. The kids have been exposed to ocean a lot, but they hadn't been exposed to the mountains as much. Angie Davis: We spent three months in snow staying at a friend's lodge. He has an outdoor snow school adventure company. I sort of exchanged some of my skills in media for accommodation and lift passes, and the kids went to ski school for three months. Kim: Yeah, a great way to do it. So, for you, you say in the article that I read about you that borders are truly an illusion. Angie Davis: Yes. Borders are an illusion. They're real in the sense of you have to get visas, and you have to go through immigration, and they're painful processes. I'm actually back in Adelaide in right now awaiting for my French visa, and my partner is back in France waiting for us. That's always a problem. Angie Davis: But there's differences on either side of the border. Particularly, for example India and Nepal. One side has a lot more poverty than the other. But once you're there, the kids just always remind us that the world is one place, and everyone, more or less, is the same, and the places always look like somewhere else. 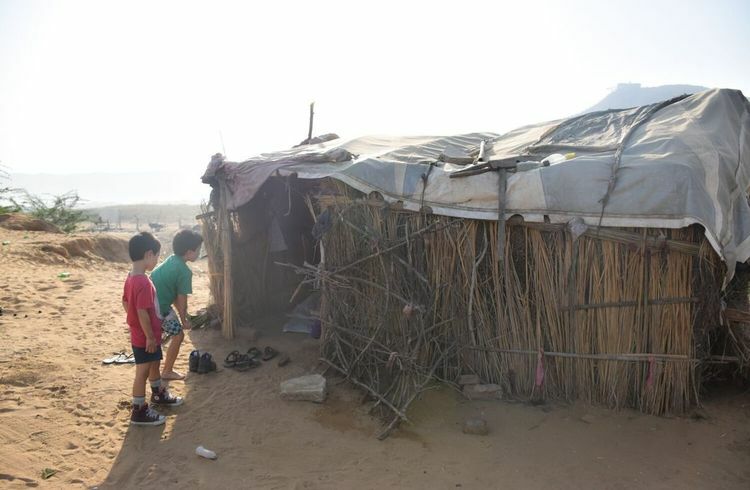 Angie Davis: So, I just feel that this whole illusion of my country, your country, is actually causing a lot of pain and suffering in the world, and when you take your kids around the world like this, you really are showing them that we're actually all connected. There's no line in the sand that says, "My country, your country." There might be a little sign that says, "Welcome to Nepal." But you're just literally walking over the same patch of earth that's connected to one country on the other side. Phil: Because I'm hoping lots of other people out there will listen to this and think about family travel. One of the ones, of course, is about education of the kids. But before we get to that, you just mentioned the thing about hopping from the Indian side to the Nepal side on a border, and the poverty is much more prevalent on one side. How do your kids handle that? How do they handle some of the less pleasant things they'll see? How have they reacted to seeing genuine poverty? Angie Davis: They have no filter, so they tell it how it is. For example, one of them was born in Japan. One of them was born in Australia. We, obviously, spend a lot of time in Japan. Angie Davis: When we went to China or even Thailand, they were like, "Oh, it's kind of ..." For example, China is like Japan only, X, Y and Zed. Only a little bit dirtier in different places. Or another place in China, like, "Oh, wow. This is like Japan, only these people are way richer." They just pull these, in their own words, they're seven and nine, so how they can decipher what they're feeling just comes out with no filter most of the time. Angie Davis: We were flying over Adelaide, actually, two weeks ago, and they were saying that it looked like Africa, because Adelaide is, obviously, in drought right now, and we'd just been to Morocco in December. So, they were like, "Yeah. It looked like Africa." I was like, "Oh. Kind of. Yeah. You've been to Africa, so you can draw those comparisons." Angie Davis: But we did go to, have lunch with this beautiful family in Rajasthan in India. We'd met a man who makes traditional Rajasthani musical instruments in the street. He was selling instruments he'd made, and he invited us back to his house, which was literally a shanty hut in the desert. He had a wife who cooked us up her breakfast, and a little daughter, and this is just like stark poverty. My kids were just saying to us after we left, like, "Oh, wow. It must be hard for them when it rains, because their house is just full of little holes. It's literally sticks, sticks put together. Angie Davis: They always want to try and help in whatever way they can. We've stayed in some pretty dire places, especially right up in the Himalayas. We did a nine-day trek in the Himalayas in Nepal. They don't complain about where we are. I think when we were going on the Indian trains, they were so excited and comparing them to five-star hotels, because they had bunk beds. Kim: Phil touched on the education. [Remy 00:07:39], your French partner, and yourself, you don't sweat over book work do you? Your children aren't learning like you would in a classroom in Australia. Angie Davis: Not exactly. I don't sweat over it, because that just adds stress to all of us, and I want education to be fun for them. I believe in education. I went to university, although I didn't know what I wanted to do at the time. I'm doing a master's course now, so education is definitely a very strong value in my life. But I just found that there's so much they can learn in a more pure form from adventuring, from learning outside of the textbooks. Angie Davis: So, what we kind of do is when we're actually moving around from place to place, we're really lax. We make them write, we all write, all four of us, a thing called Morning Pages. We write in our journals. It can be about the day, or it can be about absolutely nothing. It can be a total fictional story. They just have to write something every morning. They often write about their reflections. Angie Davis: Then when we're more grounded in one place, for example, being in France for three months last year, or now being in Adelaide, we're doing the Distance Education Program, which is the Australian curriculum. We have materials sent to us, and then the kids just have to work through those at their own pace, and they're all curated around what we're doing. We can really adapt the material to what they're doing in their lives and on our adventures. Angie Davis: With that I find that they just really enjoy learning a lot more, and they also have less rules around, for example, when they're writing in their journals, they're using words that wouldn't be in a year-two sight word list. They're trying to spell these words that they're using in their daily vocabulary, so they're taking more risks. Kim: This travel that you do helps fund your lifestyle, because you're actually a travel filmmaker. Angie Davis: Yeah, sure. I was the travel editor at Yahoo7 for a couple of years, and then I left and I went to Peru. I made my first film, Double Barrel, which was all about using travel to raise awareness about different social and environment issues, with a positive side to it rather than just this sort of doom and gloom. Angie Davis: We were looking at a coastal town in northern Peru, Lobitos, that has been overrun by the oil industry for 100 years, and the government had then discovered that surfing was a form of making money to, perhaps, replace the oil industry. But they had a very sort of shallow view of what tourism looked like for their area, and they were really at risk of being exploited with big hotels which would, of course, ruin the town in terms of building straight on the sand, and a lot of environmental factors. Angie Davis: We used the film to create an awareness campaign around sustainable tourism, and then that film actually helped the locals and local nonprofits raise the funds to get marine studies, and then this is going back three years. So then, last year, finally, the seven surf breaks of Lobitos were all declared protected by national Peruvian law, which was quite historic for South America. Angie Davis: I made that film, and then while I was making that, I was living next door to two guys in Lennox Head, Dustin Hollick and Rhian Slapp. Dustin has this idea to do a documentary going around Tasmania with no cash, no car, no phone, and only 10 personal items each. He'd had the idea for about 10 years. He'd sort of grown up there, and whilst they were always trying to find surf in Tasmania, they'd ended up doing a whole lap of the state. Angie Davis: We had this idea to make this film series called The Laps. We went down and we shot the first one, the Lap of Tasmania. I've just come back from the Santa Barbara International Film Festival where that film has done really well. Angie Davis: But it was really after filming the pilot of The Laps in Tasmania where I'm the director and the producer, so I'm with a small film crew who follows Dustin and Rhian around Tasmania for 14 days while they're trying to survive with nothing. It was really that experience that sort of convinced me that I wanted to live more or less like that myself. But, yeah, it just really inspired me to sort of walk my talk more. Does that make sense? Kim: Walk the talk. Yeah. Angie Davis: Now we're looking at turning that whole thing into a series. We've got an agent in LA who is really interested in trying to sell that out to some of the big travel channels to make a series out of it, so it's pretty exciting times. Kim: Not a bad story so far, Phil. 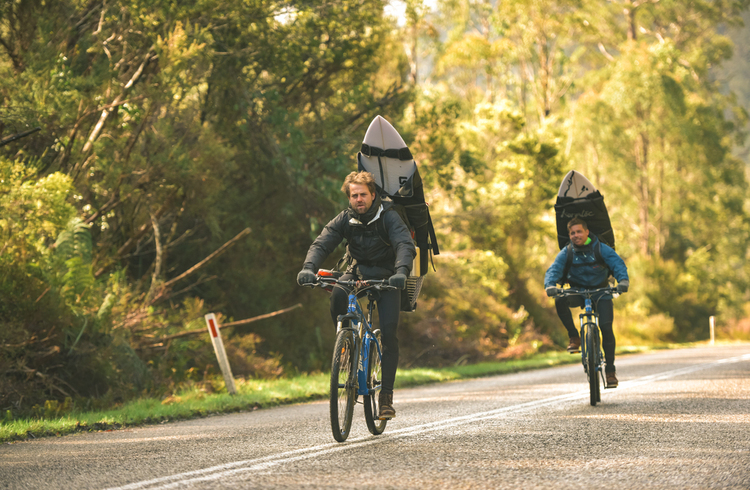 We'll pause there on Ange for a few minutes as we meet the boys from The Laps, who, once they arrived in Tasmania, put their itinerary on social media, and they were gifted a bike, each. 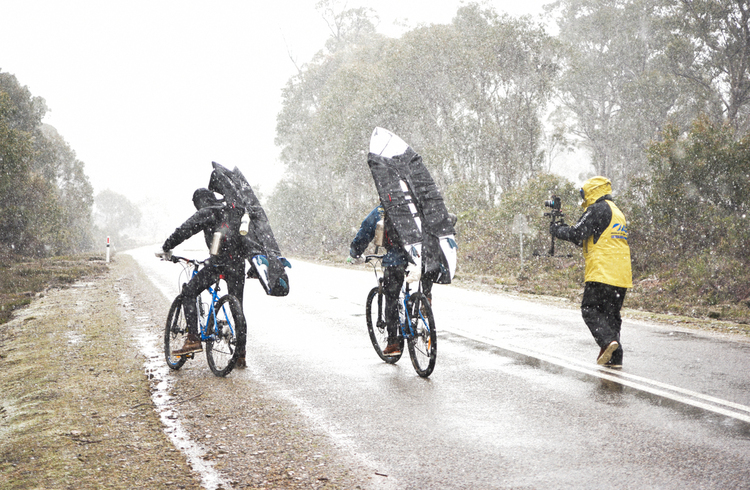 They rode around the state with surfboards strapped to their back, through wind, rain, snow, and ice. No money on them. Would not have been easy, and possibly, a little risky. Rhian Slapp: There was risky moments, but before doing the journey around Tassie, we went and did a survival course. How to light fires in wet conditions, you know, lights. And also, just how long you can survive without food. As long as you can track down water, if you can find a plastic bag to wrap it around leaves, and it draws out the moisture. Just a few little things. We weren't too worried after doing that. Kim: Two weeks around Tassie with no cash, and you completely relied on the kindness of strangers and what you'd learned in this particular course? Dustin Hollick: Yeah, that's right. We kind of went in with the idea that ... Rhian is an electrician by trade, and I'm a chippy by trade. So, we kind of thought, "Well, you know, there's a lot of people that need things done around their property, whatever. We have bartering element up our sleeves." A big idea of The Laps was that this cash economy works to a certain degree, but for the overall wellbeing of the planet it's not working out that well at the moment. We thought if we can put a little bit of this barter system into action on our journey, it'll work out really well, and it kind of kills a few birds with one stone. And it worked out really well, but people were just so generous. We didn't really do that much work. Kim: Have you been surprised at the success? I mean, it was chosen to feature at the Santa Barbara International Film Festival in the U.S. For a couple of Aussie boys, did you expect that kind of attention? Dustin Hollick: Not at all. 'Cause really, it was just a hare-brained idea just to do it, and not really to film it or anything like that. Then when we got talking with Angie more and Rhian over a few nights, we'd have a couple of beers, and kept chatting about it, and it turned into something a bit bigger, so we could film it and maybe show it around schools or something, and say, "Hey look, you don't need a gazillion dollars to be happy." It's just so cool that Ange had such a good production crew with her. Shannon, and Tim, and Jimmy [Greer 00:14:55] did such an amazing job of filming and audio recording, that it created a really good product. I guess people looked at it and going, "This is kind of funny, and I like seeing silly Aussie guys." It's just grown from there. We didn't expect it, but it's really awesome. Kim: Was there anything that happened that didn't make it to the screen? Rhian Slapp: I mean, there was plenty, but every day the production team shot about eight hours of footage. That was 12 days. It's a lot of footage, and they chopped it down to like, I guess it was 50 minutes? Rhian Slapp: It was a lot of editing and a lot of good quality stuff that me and Dustin definitely haven't seen. I've only seen the final product. I can't really remember. We were very malnourished and fatigued. It was hard. It was cold. Long nights. Dustin Hollick: One cracker was a guy that I knew, and anyway, he was a delivery driver. We're camped next to a lake near Queenstown in the middle of nowhere, and he used to come through at 3:00 in the morning, and like Rhian said, we're so malnourished, and so tired, especially this particular night. I think we'd traveled about 70 K's into headwinds that day. Dustin Hollick: He's just come and started peeking in our tent and going, "Hey. Wake up. Wake up. You guys are camped on the threatened ..." And he made up some name like, the Luciandra Holy [inaudible 00:16:16]. Dustin Hollick: "So now what?" Dustin Hollick: "Get out of here. It's a $400 fine on the spot." Dustin Hollick: And we're just going, "What? What?" And then I'm like, "Sorry, sorry. Can you go away?" Dustin Hollick: He's like, "I'm not going away. Get out here and pay your fine." Dustin Hollick: And we go, "We've got no money, though." Dustin Hollick: We just opened up the tent and this guy was like, "Dustin, I got you." Dustin Hollick: Oh, that's great, but we're sleeping on rocks, essentially. It's three in the morning. We really only just got to sleep, and now we might as well stay up. 'Cause you're not going to fall back to sleep. Kim: What did you learn about yourself through that two weeks? Dustin Hollick: I learned that, it sounds pretty cliché, but I actually learned I'm a little bit more resilient that I thought. 'Cause, I'm a pretty out of shape house dad, essentially. I go to work. I look after the kids. I don't look after myself as well as I should. I was really worried going on the trip. Going, "Oh, I think my body is just going to fall apart, and I need my couch, and I need my three solid meals, and I need this and that, the internet and Instagram." And I actually came out of the whole experience feeling healthier and better than I went in, which was a really incredible thing, I thought. Rhian Slapp: Yeah, similar to Dustin, but just being engulfed by just the rawness of Tasmania, and I love nature. I love being in nature. So, I kind of, to be honest, just really wanted to keep going and just live in amongst it. Coming back to reality I'm like, "Wow, there's so many things that you have to do." I just way preferred to be cruising around in amongst nature. Kim: Well, Phil, goes to show that no idea is a bad idea. Kim: You can see why the film is getting so much traction and popularity with those two Aussie lads lighting up the screen. We'll have a link to The Laps in show notes, and a chippy, for those outside of Australia who don't know what a chippy is? Phil: It's a carpenter. Okay, now back to Ange and what she's doing as a filmmaker in augmented and virtual reality. Angie Davis: A couple of years ago, my film mentor, Taylor Steele, his wife, Sybil, started going heavily sort of into the VR tech space for women. And she made a film that went to Morocco and was looking at a prenatal ultrasound technology that was helping women in the Atlas Mountains in Morocco. Angie Davis: We made a 360 film about that, and it premiered at the United Nations Social Good Summit. That was sort of my first real look into VR. I started to get really into it because it is just a teleportation. Angie Davis: I don't know if you've done it, but when we were in Bangkok, I put Remy in a headset for the first time. Remy is French, but grew up in Africa. He spent his first 19 years of life in Gabon and Congo. He was actually able, in Google Earth VR, to go to where he grew up in the Congo and Gabon, and just be blown away by that feeling of being actually there. For travel and also for documentary storytelling, I think VR is a powerful medium. Angie Davis: It's also fantastic, and I use it in education. An example of that would be that recently when we were in Montreal, the kids were working on a solar system project, and they had a flat piece of paper, a photocopied paper from the textbook that the teachers had sent from Australia of the solar system. Remy was trying to explain that the solar system was round, and the kids couldn't understand that, because, of course, on a piece of paper, it's not looking very round. Angie Davis: I went in my Oculus VR headset and found a solar system experience, and the kids did a, it's a 15-minute experience, where the kids are in their own little space shuttle, and they get launched into space, and then with a narrator who is basically like a museum guide, they travel around the solar system. We got them out of that, and they could answer every question. They had actually learned, because they physically connected with being there. Angie Davis: I'm working on an experience right now with an Adelaide developer, [Kodash Milani 00:20:26], and a woman named Joy, and Joy has been a palliative care nurse her whole life. We've made an experience called Parting the Veil which takes people who are in palliative care in a guided journey preparing them for the afterlife. It's a really nice way to connect with what's happening when we die, which we all fear, and we shouldn't, because it's a beautiful thing, and it's something we can't avoid, and just connects people to the soul. Angie Davis: We actually implemented a sense of travel in that, as well, because, I mean, essentially we're traveling through life, whether we're out in Africa or India, or if we're in our own homes and going through our day-to-day. We are on this journey. I think VR is a really, really powerful medium to tell these stories, and learn a little bit more about ourselves. There's so many cool things you can do in VR. I could list a ton of examples. Angie Davis: But for travel, I mean, we were just recently ... My partner is a musician, and he's not as into VR as me. He just has to come to all the things with me. I'm like, "Hey, try this out." But I got him to try being at a blues concert live. Live streaming a blues concert from New Orleans, and we're in the front row. That is just so super cool. If you can't actually get out there and travel, or if you just are not sure whether to go to Machu Picchu, or to go to the Great Wall of China, you can kind of test it out before you go, and I think that's fantastic. Phil: Look, VR certainly takes everything to a completely new level. I've had the pleasure of actually looking at some really well produced VR travel film. Have you seen any of it? Kim: I have, briefly, yeah. It was kind of an out-of-body experience. Well, not an out-of-body. It was weird. Phil: Yeah, it does take a little bit of getting used to. It's also quite funny watching the person wearing the VR set, where they're spinning around in the chair and doing stuff. That's [crosstalk 00:22:29] very funny. Kim: That's it. I think I was in a hot air balloon looking, "Whoa." Kim: Now, you can get the World Nomads podcast on iTunes or download the Google podcast app. Subscribe, write, and share. Tell your friends about us. In fact, we've got a survey on the show notes. Phil: Yes. It only takes about five minutes. Less than that, to fill in. It's embedded in the show notes. You can contact us if you've got any questions or suggestions at [email protected] Next week we're going to Malta. We sit down with Travel Film Scholarship mentor and professional filmmaker Brian Rapsey to discuss the lifestyle, industry and how he first started out. Award-winning documentary filmmaker Maranatha Hay shares her experience shooting in Managua, Nicaragua as well as her tips for budding documentary makers. Director Jennifer Peedom shares the all-to-common mistake made by emerging documentary makers and how she plots a story while still expecting the unexpected. Listen to Episode 15 of The World Nomads Podcast. Turn your passion into a profession - win an all-expenses-paid trip to Tanzania - how to catch the judges' eye.